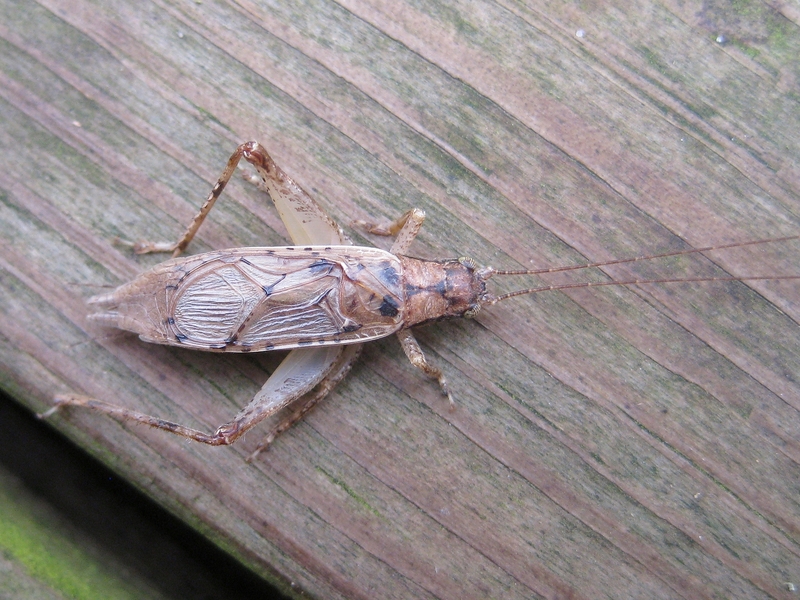 Species Status: The Orthoptera Species File (Cigliano et al., 2017) is now treating Orocharis as a subgenus of Hapithus. SINA, however, continues to use Orocharis as a full genus, which is how we are treating it (we have not yet read the paper that is the basis for this taxonomic change). Comments: The two species of Orocharis in our area are morphologically indistinguishable (Walker, 1969). 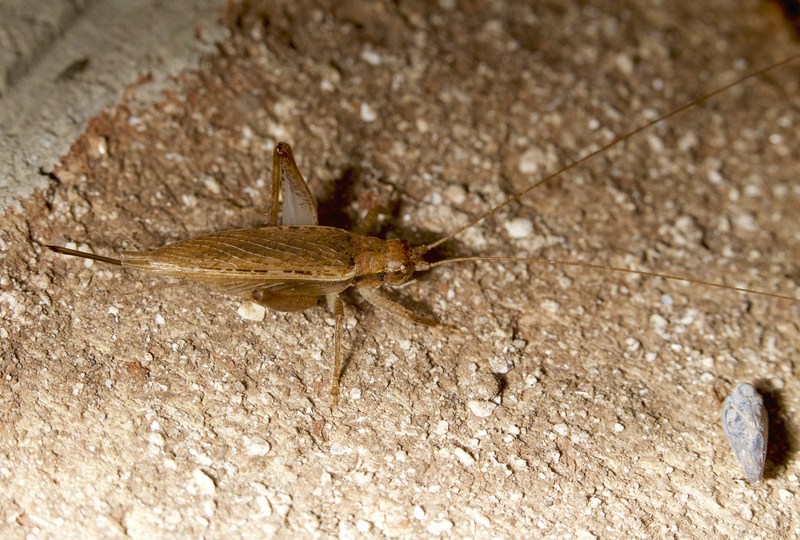 Both are medium sized, brown bush crickets with long, oval-shaped tegmina that beyond the end of the abdomen. The ground color of both sexes is pale tan. Females are nearly uniformly colored except for a dark post-ocular stripe that continues along the side of the pronotum; a mid-dorsal stripe may also be present on the pronotum. Males have scattered dark spots and speckles on the tegmina. 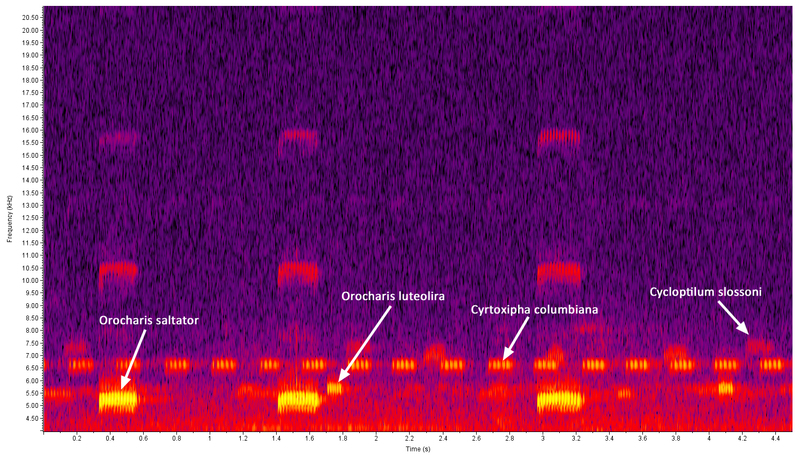 Singing Behavior: The songs both of our species of Orocharis consist of brief, fairly melodic trills (chirps) separated by pauses that are between 4-10 times longer than the chirps themselves. The chirps of luteolira are shorter than in saltator, with luteolira having between 4-9 pulses per chirp and saltator between 10-18 pulses per chirp (Walker, 1969). Walker also notes that the within-trill pulse rate is higher in luteolira -- 71 pulses per second versus 55 per second at 77 F (25 C). Correlated with this higher pulse rate, the dominant pitch of the songs of luteolira are higher than in saltator. 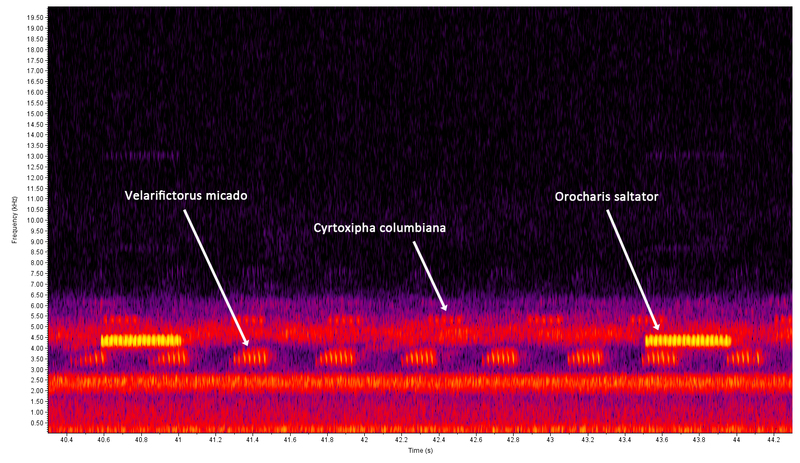 In records of the two species singing at the same site, spectrographs show a clear tonal separation between the calls of the two species, with the dominant pitch of luteolira around 4.5 kHz and that of saltator around 4 kHz at 63 F (17 C). These spectrographs also suggest that the pauses between chirps are typically much longer in luteolira than they are in saltator. Habitats: In areas where the two species of Orocharis are sympatric, Walker (1969) noted that saltator appeared to be more common in mesic or hydric woodlands and luteolira in drier, more open and well-drained habitats (e.g., sandhills). However, we have recorded both species from a yard in Raleigh, singing from ornamental shrubs and trees growing near the top of a ridgeline. We have also heard both species singing in a swamp forest in New Hanover County and from a yard in Beaufort, both within a half mile of the coast. At one site in Durham, however, Orocharis saltator were concentrated in a strip of mesic vegetation along a small trib, whereas luteolira was clustered in dry oak-hickory forest on the top of the slope. Observation Methods: Males are easily heard but hard to see. Both sexes come to bait at night. Comments: Widespread within the state and associated with a wide range of wooded habitats, including residential neighborhoods. This species appears to be quite secure within the state. Comment: Examples of shorter, higher-pitched chirps. The pulse rate in these examples is 10-11 pulse per chirp and a within-chirp rate of 36.7 pulses per sec. Comment: Singing from an ornamental Chamaecyparis in front of a store at 17:59, with the temperature about 58 F (14 C). The call seemed short for a saltator, but the number of pulses per trill is 10, and the within-chirp rate of 37 pulses per sec., which is more consistent with saltator than luteolira at that temperature. Comment: Recorded in trees outside a house. Temperature was ~ 63 F at 7:45 pm. Pulse rate was 10 pulses per trill (= 33/sec within trill). Comment: Temperature at 14:22 was about 72 F (22.2 C). The pulse rate was 12 pulses per chirp, with the within-chirp rate about 50 pulses per sec.